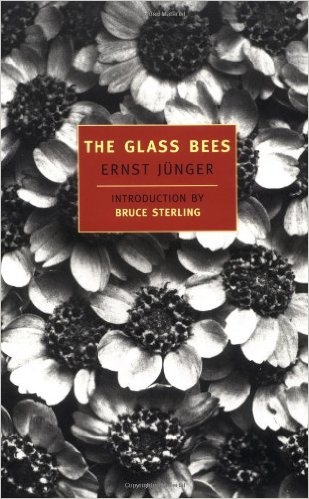 You can get hold of the copy of The Glass Bees I read here. Ernst Jünger was one of the true luminaries of the intellectual Right in the 20th century. A popular hero of the First World War, famous for his memoir of the conflict entitled The Storm of Steel, he became aligned with the German conservative revolutionary movement in the interbellum years, and as such advocated a radical, authoritarian, militarist nationalism. This being said, he never made the fatal gesture Heidegger made, and was never associated with National Socialism; his relationship with Nazism began as coolly ambivalent, progressing into antipathy and finally open hostility (he was even peripherally involved with 20 July Plot to assassinate Hitler). This being said, his contribution to political theory outside his initial context was, essentially, minimal. However, he was regarded as a figure of great literary stature in post-war Europe. He was a prolific novelist, and his incredibly long lifespan (over a century) gave him an enviable vantage point to comment from: he was a grown man when the German Empire collapsed, he was present during the rise and fall of the Third Reich, and lived to see the reunification of Germany (comfortably outliving the German Democratic Republic). His fans included a variety of contradictory figures, including Hitler, Goebbels, Francois Mitterand, Thomas Mann and Bertolt Brecht. As well as writing, he was also a well-educated botanist and entomologist. He was even one of the very earliest experimenters with LSD. He was a man who embodied the very paradoxes and contradictions of recent European existence. Richard is not a man of his time, arguably like Jünger himself. He harks back to the glory days of warfare and conflict that still felt human, battles fought with flesh and steel, and not simply with mechanisms and calculations. He feels a particular disgust at the kind of dismemberment produced by the technics of modern warfare, remarking that one doesn't find any stories of amputated limbs in the Iliad. That statement in particular becomes eerily prescient of the image of today's soldier wounded by an IED in one of our misadventures in the Middle East, missing an arm or a leg, but still alive: Richard mourns the loss of wars that killed you cleanly. Richard's world is one that has been plunging into chaos and uncertainty since his youth, when his country, Asturia, was plunged repeatedly into war, including civil war. He is a man whose principles were formed in a world now lost, and the one he finds himself in does not feel like an improvement. What is curious here is that before the Second World War, Jünger advocated Germany's complete embracing of the technological age as the only way it could find victory in the next war. He felt that it was Germany and Austria-Hungary's traditional, aristocratic hierarchy that prevented it from being able to properly mobilise itself in the total way the more levelled, egalitarian societies of the democracies were capable of doing (he discusses this in his work Total Mobilisation), and only by accepting the levelling effects of technological modernity could Germany once again find itself triumphant. 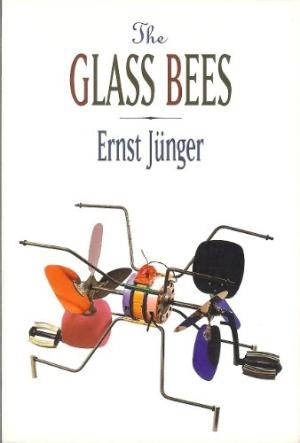 Perhaps by the time of writing The Glass Bees Jünger had simply become disenchanted with the fury of warfare. Elsewhere Richard, and maybe Jünger, speaks of the loss of the simple 'joy' of labour, of working the earth, of harvesting crops, of the well-deserved rest at the end of the long day, and how this has been traded in for labour that is certainly easier, and leisure time that is longer, but doesn't carry the same weight of satisfaction. The fear that we have lost much and gained little except damnation in return is the central theme of this book. There's a feeling of resignation in this novel. Jünger isn't really calling on us to take up arms against the machines. His constant allusions to astrology suggest that he feels that what we now find ourselves in was, somehow, inevitable. It is our bad luck to find ourselves in the midst of it, but a way out might be found if we can weather the storm of the new. This being said, Richard repeatedly describes his attitude as 'defeatist'. Perhaps the more subtle suggestion Jünger is making here is that things only became inevitable when we decided we can't stop them. THE Glass Bees is an introspective novel about a quiet but dignified cavalry officer called Richard. Unable to adjust to life after war and needing money, he applies for a security job at the headquarters of the mysterious oligarch Zapparoni. Confronted with mechanical and psychological trials, the dream becomes a nightmare, and Richard is forced to contemplate his place in the modern world and the nature of reality itself. Although philosophical and lyrical, this book is nonetheless a tense page-turner with all the qualities of great sci-fi drama. The poetic imagery is highly expressive, but there are times when the sentences are clumsy and over-long, the meaning of a passage can be lost over a seemingly unnecessary paragraph break. Whether this is down to Jünger's original German or the fault of translation I couldn't possibly say. Nonetheless Ernst Jünger stands among the most lucid and skilful of continental modern writers. Jünger's vision of the future isn't the ultra-Jacobin "boot stamping on a human face" of Nineteen-Eighty-Four - it is a subtler, more Western dystopia. Jünger is amazingly prescient in this, although he is rarely given credit for it; he predicts that the media and entertainment will rule the psyches of men, that miniaturisation and hyperreal gratification will become our new Faustian obsession and that for all the wonders and benefits of technology it is ultimately dehumanising and alienating. The new world won't be ruled by crude and brutal tyrants like Hitler, Stalin or Kim Jong Ill, but by benevolent and private businessmen, like Rupert Murdoch. We won’t be dominated by the authoritarian father-ego of Freud, but by the hedonistic-pervert of Lacan. Jünger anticipates the theory of hyperreality formulated by Baudrillard, and it is interesting that this book was published before theories on post-modernism and deconstruction became vogue. Faced with this less than perfect future, Jünger's doesn't try to incite revolution or political struggle – his message remains the same throughout his work – but to inspire individual autonomy. Despite all outward constraints, uprightedness and self-reliance is real freedom. Jünger depicts a superficial and spiritually bankrupt future, but if he is to be believed, the potential for man to be his true self is always the same.